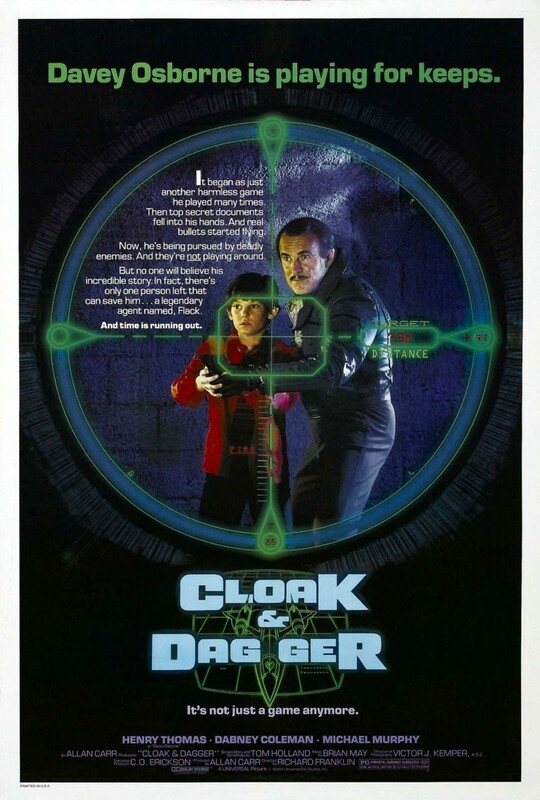 Cloak and Dagger. Universal Pictures 1984. I came across this in a 10-movie collection of cheap “family favorites” I bought with a Christmas gift, and I’m a little confused by the plot summary. The neglected kid’s video game hobby and superspy imaginary friend both figure prominently in the description, but I don’t see how video games enter into where the twist takes them, other than providing a setup for how to get there. This might just be the kind of weird concept that’s surprising to think it got made. Dabney Coleman wouldn’t be the first person I’d think of to play a superspy, but he does seem quite appropriate now that I see him here. It’s not exactly the type I know him best in, but I can picture the role as something similar that he’d be quite capable at, or he could surprise me. Davey Osborne spends all his time playing Cloak and Dagger as video game or tabletop game since his mother died. When his father isn’t working long hours as a police officer, he can’t really get through to Davey like she could, but Davey’s imaginary friend, Jack Flack, the superspy hero of Cloak and Dagger, is full of mission-practical advice. When real spies kill a man right in front of Davey just after the man slips him a Cloak and Dagger cartridge and tells him not to let them get it, nobody believes Davey’s story, and Jack encourages him to handle the bad guys on his own just like in the game, but in the real world, Davey only has one life. I think this might want to be tightened up, either expanding on some ambiguity or removing it as a distraction. I was engaged in the first part where it seemed like the real spies might be Mittyesque fantasies since nobody else was aware of them, but once another character actually saw evidence, there was a long dull part in the middle where it was just another kid with big problems adults won’t listen to story and I stopped caring. Then it became apparent that the story was aware that Jack’s advice was unwise and as tension grew between Davey and Jack, I perked back up again, partly because their disagreement suggested Jack might be some kind of actual entity like how Harvey the rabbit was a Pooka. However the part in the middle just seemed like one “running from the bad guys” sequence after another. Even in the part that bored me, Henry Thomas’s performance shone. Known for E.T., he was selling the part very well, it was just a part I wasn’t interested in. Dabney Coleman has a lot of great material to work with, and he delivers it as well, both as Jack and as Davey’s father. I’m not sure if Christina Nigra’s performance as younger girl Kim was what annoyed me, or if it was just the writing again. On the other hand, everything about the charming elderly couple was wonderful, the writing as well as the performance of the (actually real-life married) actors. I understand Atari consulted on the movie, to the extent that the movie informed a real arcade game that was retitled to match the movie and used for gameplay footage in the movie. However, I despite the “consultation”, I was bothered by the fact that the word “tape” is used interchangeably with “cartridge” to describe the medium the game is stored on, even though when it’s opened up it appears to be the solid-state game cartridges I’m familiar with, and as far as I know commercially-distributed games were never published on magnetic tape. It’s also a bit disappointing that there’s an adult character who owns a video game shop and ignores everything to play games constantly, and kind of silly that the classified information hidden in the game is unlocked by achieving a ridiculously high score that only said character is a good enough player to reach. I keep coming back to failures of the writing, and that’s a shame, because there are some very good performances and concepts here that I would have liked to have seen used much better. At least the show doesn’t get stolen by Atari products, even though one of their game cartridges is a Macguffin. I don’t want to be so hard on the movie, but I’m disappointed in the lost potential. Coleman and a great child actor can only take a half-baked script so far.